Kuala Lumpur, Malaysia’s bustling capital city, is a fantastic destination for a short break or a longer holiday. However, unlike many of Malaysia’s popular tourist hotspots, there isn’t a beach in sight. Crammed full of trendy bars, shopping malls and hotels, it would be easy to think that this South East Asian hotspot wasn’t the best place for a family trip. 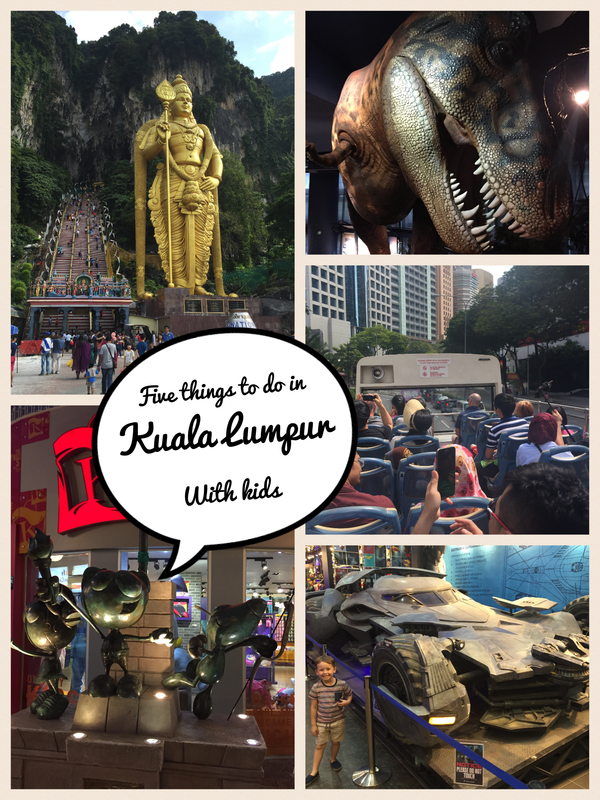 Listed below then are our 5 top picks for things to do with children in Kuala Lumpur. 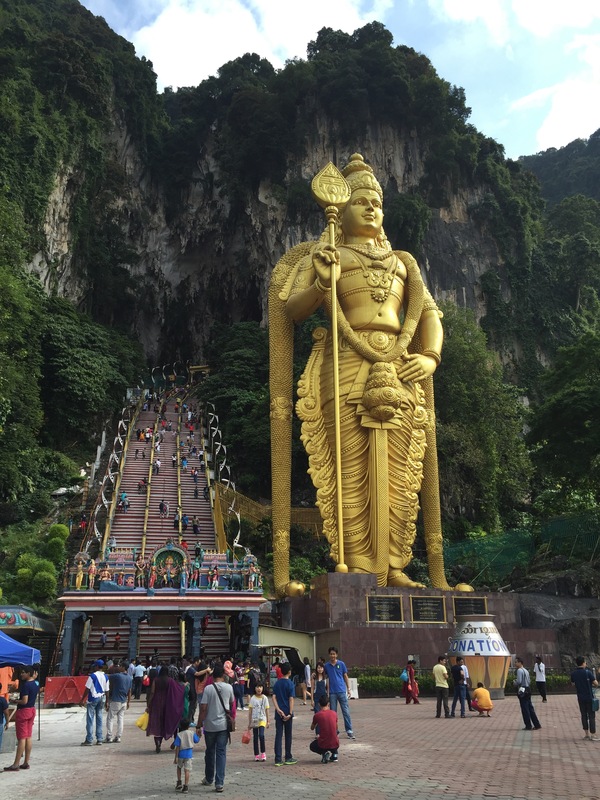 Located just outside of the city, Batu Caves is a significant Hindu holy site built into a large complex of limestone caverns. One of the most important Hindu sites outside of India, the shrine is dedicated to Lord Murugan, the deity of war and features the world’s tallest statue of the god standing 42.7m tall by it’s entrance. Characterised by the huge flight of 272 steps leading up to the shrine caves, it’s an arduous slog to the top and small feet will get tired (we carried our youngest and, to his credit, our 5 year old managed the entire flight without a single word of complaint). The draw for families besides the impressive caves and statue of Lord Murugan however, has got to be the families of monkeys that populate the stairs. From the top to the bottom, they are everywhere. Our two children had a great time alternately laughing at their antics and screaming in terror if they came too close. Situated in the heart of KLCC, at the foot of the iconic Petronas Towers, KLCC park is a natural haven in the centre of a busy city. Full of green space and with literally hundreds of pieces of playground equipment, it will keep children entertained for hours. 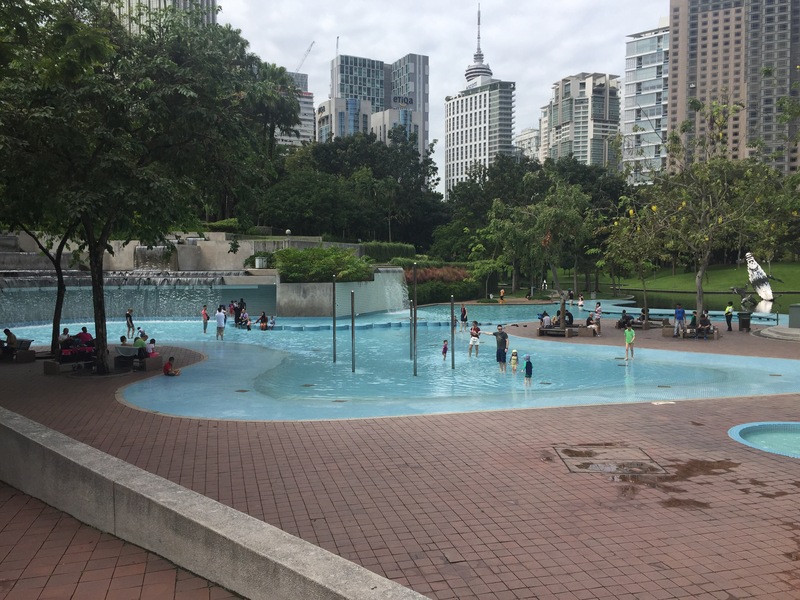 Towards the Suria Mall side of the park, there is also a large padding pool area featuring waterfalls and smaller pools for younger children. These are complemented by small changing facilities which make a lengthy, comfortable day out in the park possible. All of these facilities are also free to use. My only reservation about including KLCC park in the list comes in the form of the viciously vigilant security guards who patrol the park. They take their jobs incredibly seriously and as such it is impossible to relax over the sounds of their zealously blown whistles at busier times. Walking on the grass, playing with a ball, sitting on a see-saw with your 3 year old. All are crimes that will result in a loud blow of the whistle and a stern telling off. Bizarrely, the rule is that as an adult you literally cannot touch the equipment, even if your reason for doing so is to ensure the safety of your child. If you can cope with this then it’s a great place to spend an afternoon. And if you can’t, we discovered a see-saw out of sight towards the back of the park and played to our hearts content! 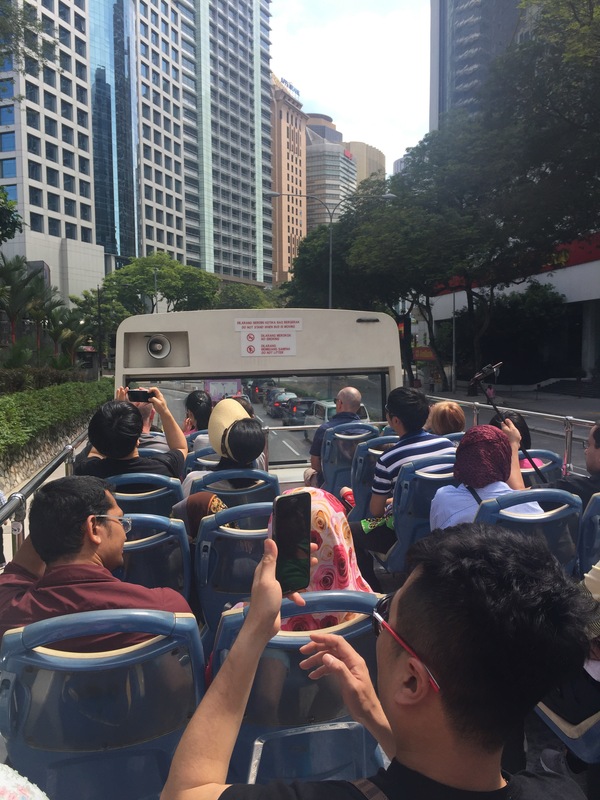 We joined this bus tour by chance after it stopped next to us by the KL Aquarium and were very glad that we did. 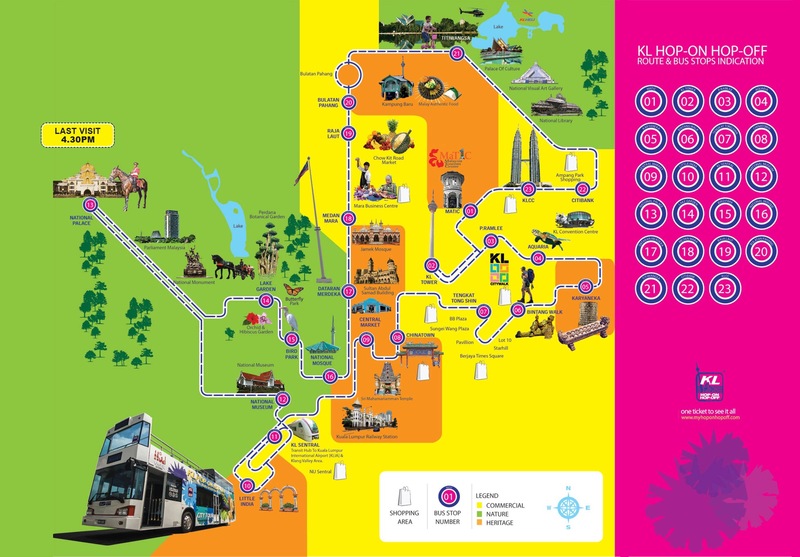 Incredibly reasonable (RM45 per adult, no charge for our 3 year old or our 5 year old) and thorough, this open-top bus tour features 23 stops conveniently located next to most of the cities main tourist attractions. The ticket also last for 24 hours (48 hours also available) meaning you can continue using the ticket the following day depending upon time of purchase. All of the buses feature a large open-top section with air conditioned seating available towards the rear of the bus upstairs and downstairs. During busy times the bus does get full and we did witness passengers at the Petronas Towers stop being told to wait for the next bus (a 20/30 minute wait) as the one we arrived on was full. Similarly, when it rains, the inside of the bus can be very full and vice versa, when the weather is good, outside seating is at a premium. 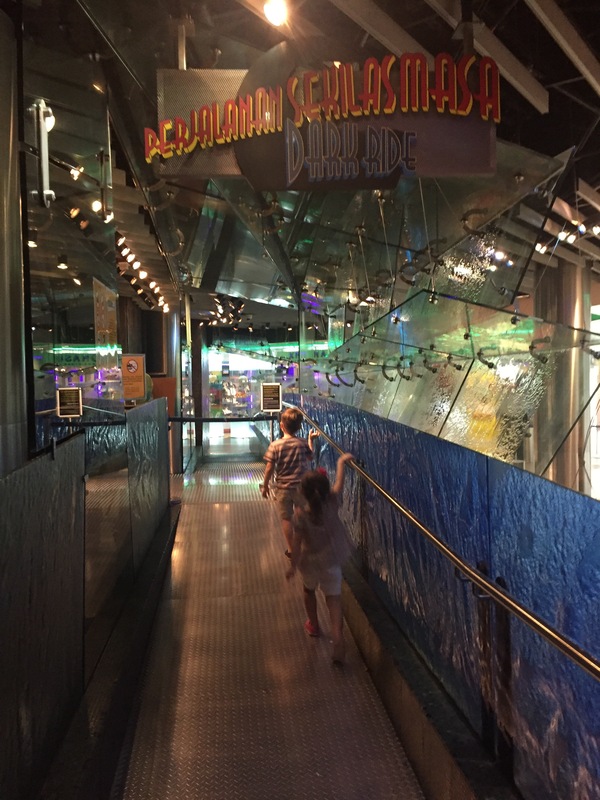 A surprising diversion at the top of Suria Mall, Petrosains Discovery Centre is a fantastic attraction for children of all ages from the very young, to young adults. A dark ride, dozens of interactive experiments, building areas, a large dinosaur and volcano diorama and more. Check out our full review of Petrosains here. Just outside of the city centre by The Curve, Kidzania offers a world of fun for young people of all ages. For those unfamiliar with the concept, Kidzania is an entire indoor city designed for children. 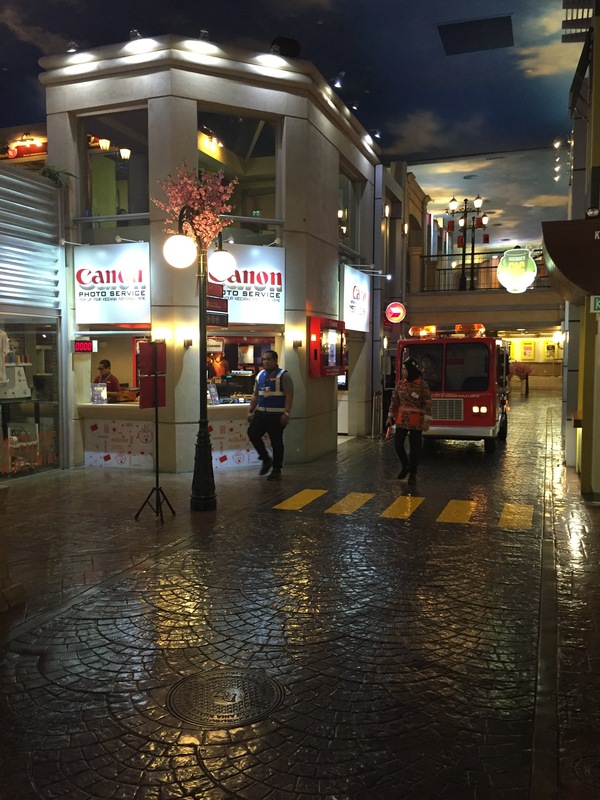 Kidzania KL is based around 2 main streets on the ground floor and one winding thoroughfare upstairs. The streets on all sides are populated by business’ and services, which are sponsored by familiar, real-world business’ and all of which provide fun activities for children. From fire fighting and driving an ambulance to stocking shelves in a supermarket and constructing their own burgers at McDonalds; families will love Kidzania. The sheer variety of things to do and value for money present in the ticket price is the reason this takes the number one spot when choosing things to do with Kids in Kuala Lumpur.